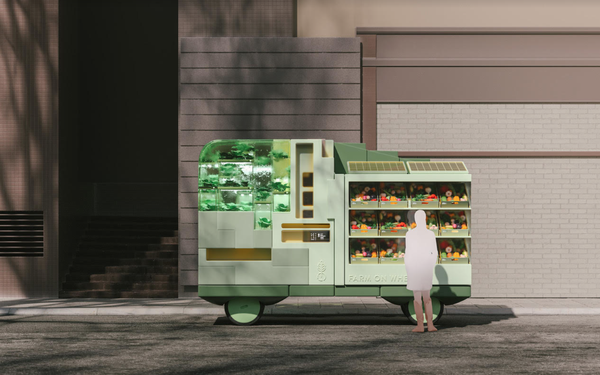 Visual trend lab and brand image consultancy f°am Studio has designed seven autonomous vehicles in collaboration with Ikea future-living lab Space10. The project, called Spaces on Wheels, challenges the traditional idea of the car, leveraging design and augmented reality to showcase how self-driving vehicles could support the activities we spend the most time on along with moving us from point A to B. The seven designs aim to trigger conversations and reflect the potential future ecosystem of flexible, purpose-built spaces for vehicles in the categories of office, cafe, healthcare, farm, play, hotel and shop -- with clean lines, rounded edges and modern forms that draw the eye, according to a release. Berlin-based f°am Studio spent two months developing the designs. F°am Studio is represented by Friends Electric in the United States and United Kingdom. Besides autonomous vehicles, there must be cities that prioritize pedestrians, bikes and public transportation much higher, Van De Poel says. This would not only redefine how people and goods move around our cities, but also redefine the very fabric of our daily lives. To allow more people to envision a future ecosystem of self-driving electric vehicles that are available on demand and designed to accommodate diverse needs and lifestyles, Space10 and digital design studio Norgram added a feature in the Space10 app, where consumers can order and explore each of the seven Spaces on Wheels direct from their phone via augmented reality.